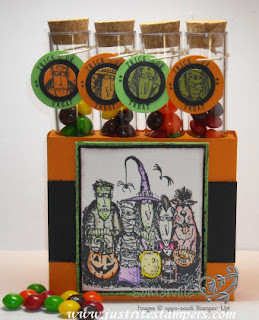 Last week on my quest to find some alterables at Michaels, I came across these test tubes in the Martha Stewart Halloween section - aren't they fun! I love to create templates for boxes, for this particular box, I wanted an insert to hold the candy filled test tubes so they wouldn't move around. After playing for a bit, I came up with one that works, the test tubes fit nicely in the 1" circles I punched. The image on my box is SU's Tableau of Terror, I used the TJNL technique Marker Watercoloring to add color to my images. For the circles hanging on the test tubes, I stamped my images on colored card stock, punched them with the 3/4" circle punch, layered them on a 1" black circle, used my JustRite Small Letter Set to spell out the words Trick or Treat and punch that with my 1-1/4" circle punch. I think the Small Letter Set from JustRite has got to be one of the most versatile stamps they offer, it's great to add personalization to all your stamp projects! I am coming to your house for T or Treat and I want one of those! How many are you making?!!LOL! Beautiful and amazing...the project and YOU! Just adorable! I have some of the smaller tubes I may have to come up with a pattern for them! Very creative and festive! Love it! Super Cute! I LOVE Halloween! It is just fun and stress free! this is so darn cute! i think i'm going to make some for my grandsons birthday as favors.